Rodney Sam with part of his transport fleet, he has been able to secure a bank loan and build a business because the DME press provided regular cash flow. This is because Kokonut Pacific guarantees to buy all the export quality oil. This allows people security and certainty to start business, take out loans and get ahead. The country was almost bankrupt 2004. When we first started working with the locals, the country was almost bankrupt. To gain momentum, they needed money, but the biggest problem was that no-one could get a loan, so development was at a standstill. He finished school in grade 5. Now he runs three businesses across oil, transport and property. Meet the Malaita man on the move, Rodney Sam. 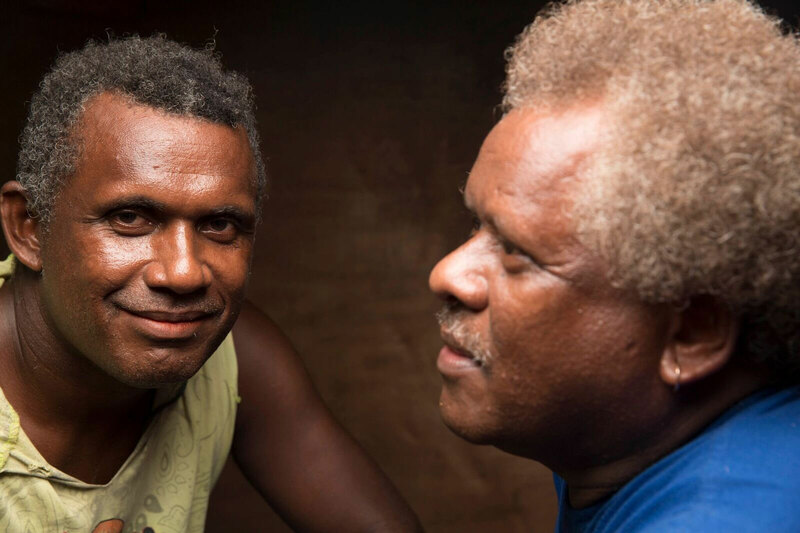 Rodney started working in his neighbour Joses’ DME unit in the province of Malaita, Solomon Islands making virgin coconut oil. Now he has his own DME unit and has established a multiple income stream business with interests in property and freight. Where only 10% of the working population have jobs, Rodney’s entrepreneurial success is a light of hope in an impoverished country. It all started in 2010 when he was successful in bidding for a government grant to partially fund the purchase of his own DME unit and set up in Manaere Village in north-west Malaita. Having already worked in a DME unit – he knew what to do. With his wife as supervisor, Rodney set up and started making a little money. One of the biggest problems in these remote rural communities is transport. So Rodney bought a second-hand 3-tonne flat-bed truck to transport his oil and other freight. Now he had two businesses. With the little cash he was making he then built a house and rented it out. With income from three businesses he was able to buy another house. His first truck was very old and not so reliable. Seeing the need and opportunity and with regular cash flow, he was able to approach the Bank, which has funded his next new truck. The fact that he can get a loan is testimony to how much life is changing for people who are slowly gaining traction, thanks to the income from the original DME unit. When Kokonut Pacific started working with the locals in 2004 the country was almost bankrupt. To gain momentum, they needed money, but the biggest problem was that no-one could get a loan, so development was at a standstill. Two brothers mix tradition and enterprise. Traditional facial scarification identifies them as being from their homeland, the Solomon Island Malaita. Both have worked hard to start several businesses making virgin coconut oil, driving trucks and building houses, to lift their village from poverty to prosperity. It is a slow process over many years, but there is great hope in empowering people through trade not aid. Through the development of micro businesses like the DME units, over many years, local people like Rodney have gained ideas and practical experience about how to run a business. When loans were not an option, DME provided him with the steady cash-flow that every business needs to survive. 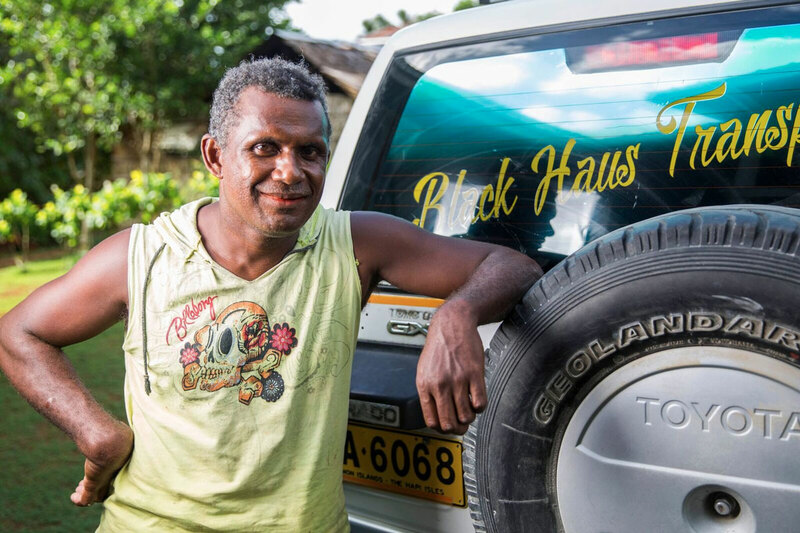 Solomon Islanders are embracing the ability to do business and are empowered through trade not aid. Why was he attracted to DME? Because he loves the impact that it makes. When DME comes to the village, it’s not just Rodney that benefits but everyone along the chain. What future does he see? “Ten trucks” he answers happily. Anyone need a lift? Rodney is on his way, thanks to a humble start making DME virgin coconut oil - and he is taking his village with him.